The Ingrams raised Mark in Michigan. He attended Grand Blanc Community High School through his junior year and transferred to Flint Southwestern Academy for his senior year. Mark continued to play four sports in high school. In football, he was a four-year varsity starter. In his last two seasons, he racked up 2,546 yards rushing and 38 touchdowns. He was also a standout cornerback. Mark was a two time all-state selection in track and in baseball. He was a four-year varsity starter on the diamond with a career average of .563. When it came time for Mark to pick a college and a sport, it was a no-brainer. A four-star recruit in football, he accepted a scholarship from the University of Alabama. He chose football because he wanted to play in the NFL like his dad. Mark came out running for the Crimson Tide. In his freshman year he made the 2008 SEC All-Freshman team. His sophomore year might be one of the most impressive seasons in college football history. Mark's best game in 2009 was against the South Carolina Gamecocks when he rushed for 246 yards. By the end of the season, Mark had a total of 1,658 rushing yards and 17 touchdowns. 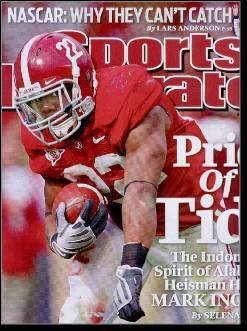 He led the Crimson Tide to the 2010 BCS National Title with a 14-0 record. His performance was so good that he won the Heisman trophy. He was the first Alabama player to win the award. Mark was sidelined for the first three weeks of his junior year due to minor knee surgery. Though he fell short of his fantastic sophomore season, he still decided to declare himself eligible for the 2011 NFL draft. Mark was the 28th overall pick, just like his dad, and was taken by the New Orleans Saints. Mark's first season as a Saint was a good one. He was part of a four-man rotation that included Chris Ivory, Darren Sproles, and Pierre Thomas. Mark rushed for 474 yards and 5 touchdowns, and he led the team in attempts with 122. Mark upped his rushing total in 2012 to 602 yards and scored 5 touchdowns. He continued to play a reserve role through 2013 and finally won a starting job in the New Orleans backfield in 2014. He rewarded the team with a career-best 964 rushing yards and 29 catches, earning his first trip to the Pro Bowl. Mark was on his way to another solid season in 2015 when he inured his shoulder in a November game against the Redskins. He ended up starting 10 games but still finished with a team-high 769 yards, as well as 6 touchdowns. Mark’s biggest impact was as a receiver. He caught 50 passes to lead all New Orleans running backs. Mark was healthy and back in the starting lineup for the Saints in 2016. He was particularly good against New Orleans’ division rivals. Mark racked up 158 yards and a pair of touchdowns in a 41–23 victory over the 49ers and 146 yards and two scores three weeks later in another blowout win, over the Rams. He was named NFL Offensive Player of the Week after the Rams game. He finished with 1.043 yards, becoming the first Saint since Deuce McAllister in 2006 to reach four figures. The Saints added veteran Adrian Peterson and rookie Alvin Kamara to their backfield in 2017, but Mark took it up a notch and was among the NFC leaders in rushing yards and touchdowns for most of the season. He finished with 1,124 yards and 12 touchdiwns. He and Kamara each racked up over 1,500 yards from scrimmage. No running back duo in history had ever done that. Mark got his second Pro Bowl nod for his performance. Unfortunately, he was suspended for the first four games of 2018 for violating the league's performance-enhancing drug policy, losing the starting job to Kamara. Mark showed great maturity and poise dealing with his father's legal and financial problems since he was a teenager. Big Mark was arrested for money laundering and bank-fraud. He was released from prison in 2015. Through it all, Little Mark was still proud of his dad and has beem willing to do whatever he can to help. They speak several times a week.